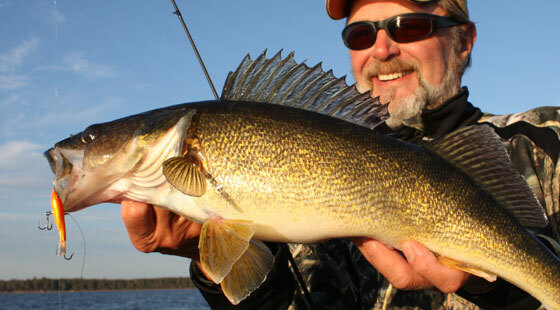 Walleyes in the wrong place and not biting what they should be this summer? You’re not alone! But fear not, Al Linder is here to share three can’t-miss tactics to put ‘eyes into your boat – and without live bait. The following three bites, Linder says, are on now pretty reliably in Minnesota’s famed Walleye factories like Otter Tail, Leech, Mille Lacs, Red, Cass and Vermilion, as well as in lakes like them throughout the Upper Midwest: Weed bite, Structure Bite and Suspended Bite. In most of the larger lakes known as go-to walleye destinations, there’s always an active population of weed walleyes, Lindner says. “Day in, day out, you can catch ‘em in the middle of any weeds sparse enough to be fishable and pull a bait through,” he says. Linder’s favorite way to catch walleyes in the weeds is casting a VMC® Neon Moon Eye Jig dressed with a boot-tail or split-tail soft-plastic grub. Target weeds in 8 to 12 feet of water in low-light periods. An improved take on a traditional Aspirin-shaped jig-head, VMC’s Moon Eye Jig provides added control on the fall and features 3-D holographic eyes for realism and the illusion of a wider profile. 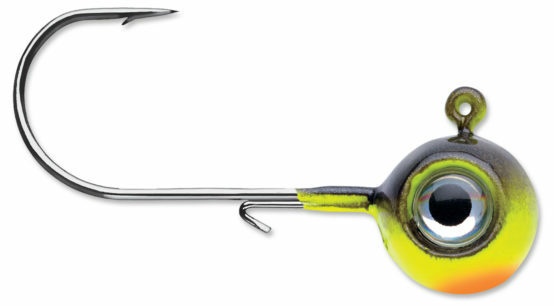 Neon Moon Eye Jigs are available in 23 color patterns. They come armed with premium VMC high-carbon steel hooks with a top-of-the-line black-nickel finish. Long predominant as ice-fishing lures, Jigging Raps were proven equally productive as open-water baits in the last several years by Lindner and some others. Featuring a balanced, weighted minnow profile, Jigging Raps swim in tantalizing circles on the fall, inimitably simulating the erratic characteristics of a wounded baitfish. When fished through the ice as they were designed for, they work best with a vertical pump-and-swim action. A successful open-water presentation, however, requires aggressive rod snaps throughout a horizontal retrieve. A third population of walleyes spend much of the summer suspended in the open water of deep basins, chasing baitfish. “So forget what you know about structure and throw a No. 9 Shad Rap® over the back of the boat, stick your rod in a rod holder, leave a lot of line out and just start trolling in the middle of nowhere,” Lindner says. The benchmark that other crankbaits are measured by, Shad Raps are innovative where others are only imitative. Built from premium balsa wood, they twitch, quiver and wobble on the retrieve with a lifelike action unmatched by any rival. Copycat crankbaits not made from balsa wood might look the part, but they won’t produce as many bites. A No. 9 Shad Rap measures 3 ½ inches and will run 8 to 15 feet deep. Shad Raps are available in 29 color patterns. Suspended walleyes are usually most active in the evening. And they’re usually big. If Lindner observes baitfish breaking on the surface in the evening, he’ll reel in his Shad Rap and troll a No. 11 Original Floating Rapala on a planer board at ten feet or shallower in basins as deep as 40 to 100 feet. Built from balsa wood for inimitable action, Original Floating Rapalas are hand-tuned and tank-tested to ensure their world-renowned action, straight from the box. Available in 22 color patterns, they feature premium black-nickel VMC treble hooks. A No. 11 Original Floating Rapala measures 4 3/8 inches and will run 4 to 6 feet deep. Used to fish my favorite walleye lakes in the Boundary Waters of Minnesota years ago. In the dog days of summer into fall, our evenings would find us heading to the shallow sandy bays with scattered bullrushes in 4-8 feet of water. Floating rapalas were the ticket and the fish couldn’t resist them! I remember one night on the full moon in August when I caught a 6 pounder right next to the canoe. I had tied on a original floating Rapala and just tossed it overboard. Before I could even pick up my rod, the fish exploded on the floater! Repeated that scene many times. It makes for some of the most memorable walleye fishing of the year! Don’t miss out! Get out there in the next two months and get on them! WENT TO THE ONLY LURE i WANTED AND YOU ARE OUT WHAT KIND OF OPERATION IS THIS? We hope to have more available within the next two weeks. You can also check with our many Rapala dealers such as Bass Pro, Cabelas, Dicks, Mills Fleet Farm, Amazon, Tackle Warehouse, Scheels, etc.